“Let’s not blame it on Clinton. Let’s solve it,” the President said. This is a very interesting look at the biases of the top echelons of the media, from a pre-2008 perspective. Ari Fleischer’s memoir takes place from the Bush transition in 2000, through September 11, to July 14, 2003. He talks about being the Press Secretary, and not about the campaign. It pretty much starts with “I’d like you to be my press secretary when I win,” the day of the election. I didn’t think America should feel guilty about its role in the world. It seemed to me that our government was unnecessarily apologizing for events around the world. I thought the Democrats sounded as if they cared about people, particularly minorities and the poor, more than the Republicans. I thought Republican ideas, however, were more effective at helping people. What turned the debate was Ted Koppel’s using his anchorman’s authority to subtly suggest that the attacks on Hillary were misleading. All I had to do was fall in behind and remind viewers that the Republicans were up to their old tricks. I believe it is the moral duty to intervene when evil has power and uses it. If Europe were to apply as much pressure on Saddam Hussein as (it) does on the United States and Britain, I think we could prevent war. According to Fleischer, it received no television coverage, and scant newspaper coverage. Why? Because he agreed with President Bush. If he had disagreed with the war on Iraq, it would have been front-page, led the network news. I tried to find the video that Fleischer talks of; all I could find were broken links and one article in the Deseret News. So the event definitely happened, but none of the press thought the video worth preserving.1 The photo I’m using for this article is from a different meeting in 2007. It isn’t just that the press highlighted Mandela and downplayed Wiesel. Mandela’s statements had been more anti-American than anti-Bush, beginning with “And if there is a country that has committed unspeakable atrocities in the world, it is the United States of America” and going on to accuse the United States of unthinkingly using the atomic bomb on Japan. ABC cut that part out to make Mandela’s criticism sound more reasonable on American television sets. Overall, Taking Heat appears to be an attempt to gently chide the news media for obvious biases that do the American people a disservice. He gives them some face-saving excuses in the hope that it will make it easier for them to change. Instead, of course, they doubled down on deception during the 2008 campaign and have not resurfaced since. I keep coming back to my own epiphany over the summer of 2007 that if you watch television news or read the Associated Press, you’re stupider than if you don’t. Whether it’s giving the left a pass on things that they really should have to defend, or making things up about the right, forcing them to defend things that never happened, you either end up believing things didn’t happen that did, or that things happened that never did. During the anthrax case in Florida, Tommy Thompson speculated in response to a hypothetical from a reporter about whether the patient drank from a stream. It turned out to be a classic example of why you don’t respond to hypotheticals. Despite the suggestion coming from a reporter, other reporters, when it didn’t pan out, took it as coming from Thompson. They started reporting on Thompson’s “missteps”, his “inconsistent, confusing, and even wrong” information. Poor Tommy Thompson. He tried to help the press, but they didn’t return the favor. Later, ABC ran a story linking anthrax to Iraq. They asked the White House for a response 15 minutes from airtime. Still, he was able to get a definitive answer: ABC was wrong, completely out in left field. So Peter Jennings led with “despite a very recent denial by the White House”. ABC implied that the Bush White House denied the story because they did not want to go after Saddam Hussein. When ABC finally retracted the story, they did so by claiming that the White House had only recently discovered new evidence—in fact, by my reading of ABC’s expert, blaming the White House for the initial report. Nothing makes juicier news than a good, old-fashioned Republican vs. Republican, or Democrat vs. Democrat fight. Intraparty splits make interesting story lines. At the time he wrote this, at least, Fleischer believed what I believed at that time: the press’s bias is in favor of conflict. While there’s still some truth to that, I think nowadays the bias in favor of leftist policy takes precedence. And reporters always seem to have to sound a “down note” during a Republican administration, as opposed to their continual surprise at bad news during the current administration. Even when the economy improved three times faster than the experts had predicted, bringing in 308,000 jobs in the spring of 2004 and 1.2 million over three months, reporters still had to try to suppress hope. “Is it enough?” and “Can it continue?” were common last sentences in 2004, back when an unemployment rate of 6% was high. In the cycle of journalism, good news can’t stay good for every long. Nowadays, of course, you could say the opposite. Every new bit of bad news is reported as “unexpected” and surprising. And while he thought conflict trumped politics, he did recognize that the liberal narrative was always the default narrative in the press. Anyone against the liberal narrative was an obstructionist, an anti-something. The press hold themselves out as neutral, favoring neither Republican nor Democrat. Yet when the words they use and the impressions they convey repeatedly inform readers and viewers that the Republican Party is made up of conservatives and right-wingers, many of whom are “angry,” and the Democratic Party is made up of women’s groups, activists, civil rights leaders, and antipoverty groups, one party sounds more fringe than the other. For better or worse, one party is ideologically branded, and one party enjoys neutrality bordering on positive labeling. It’s one reason why many Americans don’t have confidence that the press are as neutral as the press purport to be. Debates over campaign finance reform is about reform, not free speech, but debates about government funding of abortion are about abortion rights rather than reform. Finally, “there are no meetings where they agree to act this way”. But that was before the leak of the Journolist archives, which started in February 2007, a few years after Taking Heat came out. 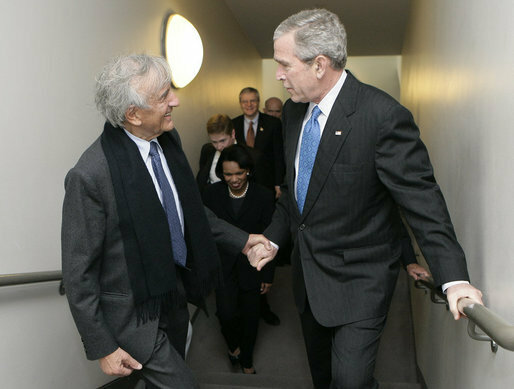 The Bush administration had a markedly different style compared to other administrations, including President Obama’s. By the end of 2000, before Bush even took office, it was obvious we were on the cusp of a recession. What to do about it? The thing is, if you solve it before it happens, you get no credit for it. Whether it was the recession of 1920, or the recession of 2000, or the recession of 2001-2003, no one remembers the things that only almost happened. In the end, the legislation gets signed into law, and that’s what good government is all about. That said, it’s going to be hard to find a politician who says that good government is limited government. This is something I’ve been saying since at least 1995: the likelihood of mass destruction by terrorists is increasing; the graphs of wherewithal required and desire to act are converging. Bush seems to have realized that. I don’t think too many other people have yet. Yes, I said, he ruled out discussions. He wants action, not words. Fleischer presents Bush as more than the stereotypical guy you’d rather have a beer with. He’s the guy you’d rather have as an employer, too. In a land as hopeful and optimistic as America, I refuse to believe that news is only, or mostly, bad… Even when things have gone wrong for our nation, we’ve always seen the bright side and found a way to forge ahead, to make things better, to fix and improve, and along the way America has excelled. The American people are capable of handling good news, too, he says. It shouldn’t be suppressed. Reading Taking Heat right after All Too Human is like Night and Day. Fleischer is never embarrassed to defend his President; his problems are all policy-related, even though the press tries to make them process. They’re never about personal problems. Fleischer is not as facile a writer as Stephanopoulos. But he also provides a less egocentric view of the press’s place in our national discussion, as well as his own place in the White House hierarchy. If you’re interested in White House politics, this is a unique perspective and well worth reading. I think if I were to give any future Republican President advice, it would be to have your own video of every event, and post it to either YouTube or a special White House site. If you enjoy political, you might also be interested in Being There, Bulworth, Wag the Dog, and Losing America. If you enjoy White House, you might also be interested in All Too Human and Front Row at the White House. A horse chestnut or a newspaper or a news show? Abraham Lincoln once famously asked whether a horse chestnut or a chestnut horse are the same thing. The mainstream media have started dropping a whole lot of horse chestnuts over Sarah Palin. It’s hard to imagine this is anything but bias, but it could be abject stupidity. A great look at the Press Secretary’s view of the press from the White House podium. Taking Heat last modified April 21st, 2011.